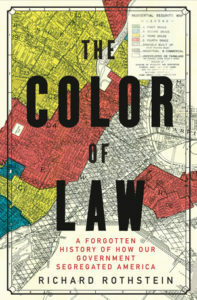 Join us for an engaging and important discussion about the Color of Law, by Richard Rothstein. We will be discuss the findings of the book, and how planning policies and programs can work to rectify the historic disparities encoded into land use and other laws. The event is free to attend. Coffee and snacks are on your own. This book was selected by more than half of respondents to the recent member survey for the book club. Please start reading the book, and get ready to engage in a compelling conversation about creating a more just and vibrant community. Cost: Free to attend. Coffee and snacks are on your own. Transit: The coffee shop is short walk from the Wilshire Vermont Red/Purple Line Station, Metro Rapid 720 and other lines. Parking: Paid and street parking are available nearby.